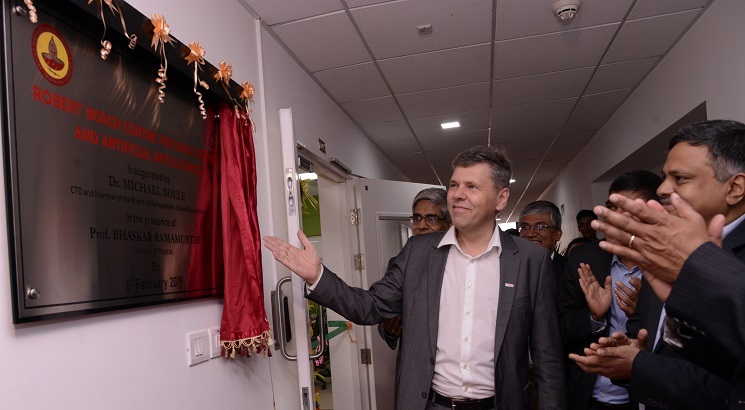 NEW DELHI, FEBRUARY 6: The Robert Bosch Center for Data Science and Artificial Intelligence (RBC-DSAI) has been inaugurated at the Indian Institute of Technology Madras (IITM). The RBC-DSAI will undertake foundational research in many areas of AI and Data Science, namely deep learning, reinforcement learning, network analytics, interpretable machine learning, and domain aware AI. The areas of activity include research projects, knowledge management and dissemination, outreach projects, and setting up collaborative facilities and laboratories. “The center’s mandate requires interaction with industry and other universities, including international student and faculty exchanges. The objective is to advance scientific innovation for societal benefit,” says Prof. Bhaskar Ramamurthi, Director, IIT Madras. RBC-DSAI has the largest Deep Reinforcement Learning group in India. Researchers at RBC-DSAI are also looking at networked data across different disciplines – biology, transportation, water distribution, process modelling, online social media, telecom, and reaction networks. “Bosch has funded two important technology areas with Cyber Physical Systems and Data Sciences & AI at IISc (Indian Institute of Science) and IIT-M. By working together and conducting aligned R&D activities, they could accelerate major breakthroughs which will have wider societal impact,” says Dr. Vijendran Venkoparao, head of technology strategy and university relations at Robert Bosch Engineering and Business Solutions. “This partnership between Bosch and IIT-M will accelerate research for societal impact, taking a long term view for India”, says Vijay Ratnaparkhe, president and managing director at Robert Bosch Engineering and Business Solutions.